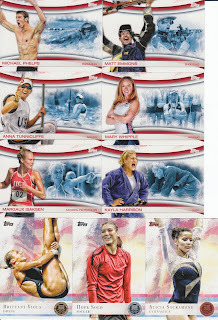 Topps finally did what should have been done for years and years, produced a set centered on the Olympics! The fan base for the Olympics goes well beyond the boundaries of the hobby. This is a set that has a chance to rope in a much wider audience. 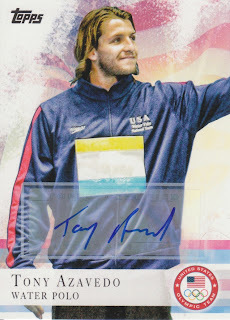 So, the wife being such a big Olympics fan that she is, and with the chance of some pretty cool autographs and relics, I picked up a box for her to bust this weekend. My wife has already said it, I'm a pig. But these are some nice looking cards, don't you think???? Most of the cards are action shots, with some of them being medal ceremony shots and a few being posed (see Morgan, Alex). Each hobby box is said to contain a complete 100 card set, and that rang true from our box, with a total of 25 duplicates (more on those later, you'll want to read to the end...). The scan above are all duplicates. The top 6 show off some of the current Olympic champions and their sports; on the back it gives a nice little snippet detailing the sport as well as the current all-time leading medal winning country. The three cards across the bottom are the Gold, Silver and Bronze parallel sets (the theme continues). In our box we got 8 gold, 12 silver and 24 bronze. Putting these 100 card sets will be a challenge, but if someone does it, that is going to be a really nice set of cards! The top card is the manufactured relic. There are several different kinds of these in the set and we got the manu-patch for the US Olympic team highlighting the Water Polo team. I've seen some nice American Flag patches and then some pretty cool pin relics as well. Gotta give Topps credit on these, they are pretty slick. The other relic is a piece of Athlete Worn Relic from Alicia Sacramone of the Gymnastics team. It was nice to get a least one name I had heard before! 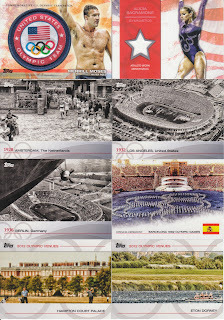 Below that are some more inserts, with the chronological Olympic History cards being my favorite. It's really cool to see where all they've been through the years. The Opening Ceremony card I could do without, but the Event Venue cards from the 2012 London games REALLY piqued my wife's interest as she LOVES English royal history and was very excited to see a card with Hampton Courts Palace on it (a place she's been and loved). Needless to say, she's excited for the 2012 games! Anyways, my overall impression of this set: Pretty Cool. Not quite AWESOME but you can't beat the fact that you get a complete set from 1 box, and that the parallels, hits and inserts are pretty decent. I don't think we'll be buying any more boxes, but the wife may track down an auto or two she really wants. I told you to keep those duplicates in mind. Because here we have a little contest for anyone who read this far, and who cares about Olympic cards... leave a comment on this post mentioning your favorite Summer Olympic event, your favorite Summer Olympian or favorite Summer Olympic moment. At the end of the week, I'll randomize all the entrants and the winner will get all 25 of the duplicate cards we pulled! My favorite Summer Olympic moment is going to the Cuba/Australia baseball game in Atlanta in 1996. I got to take my dad with me 1 year after he had bypass surgery. I'm more of a Winter Olympics kind of guy... but I have to admit these cards look awesome. My favorite Summer Olympic event is probably basketball... although I watched more swimming four years ago than anything else. How could you not watch Phelps chase those 8 Olympic gold medals? I'm a big track and field fan and am going to be pulling hard for former Razorbacks Wallace Spearmon and Tyson Gay. They both have cards in this set and I'm hunting pin cards of both of them on eBay. I actually know Wallace a little bit- so I'm particularly interested in his stuff. I really want to bust a box of this stuff! My favorite Summer Olympic moment wouldn't involve watching the Olympics. It would be receiving TTM autos from a Gold medalist (http://playattheplatedude.blogspot.com/2009/10/first-allen-and-ginter-ttm-success.html) or touring the US Olympic training facilty in Colorado Springs and being guided by an Olympic weight lifter. It was a lot of fun and the kids thought it was really cool. My favorite summer olympic event is the 100meter dash, get to see the new crowned fastest man of the world. I also was able to catch a baseball game in Atlanta in 96. That was awesome. 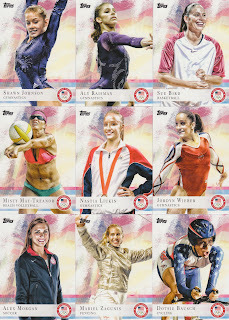 But I'm a huge fan of the olympics so I might have to see about a box of these cards! My favorite Olympic sport *was* softball, until somebody made the *brilliant* decision to take it out. So now I have to say that my favorite Olympic sport is swimming. Oh, how that hurts. Hadn't heard of these. Pretty cool. Thanks for sharing. My favorite event is probably swimming or women's gymnastics. I used to bad mouth it but I became a huge fan of Nastia Luiken last Olympics. I even have my picture with her! The cards look great. I guess the women's gymnastics would be my favorite event. As a high school and college participant, I really enjoy watching wrestling. I saw Kurt Angle win his gold medal before going the WWE route and watching Rulon Gardner beat Aleksandr Karelin on TV was amazing! That said, I'll also watch a LOT of Olympics coverage this summer. I love the Winter Games,esp. the Curling and Hockey.Used to love the Baseball before the brilliant commitee thought that no one watches it. Lots of Mail To Catch Up On!!!! Tired Of Seeing GQ On My Blog Yet??? A Big Hitter Knocked off the List! Crazy Day of Purchases and Trades! 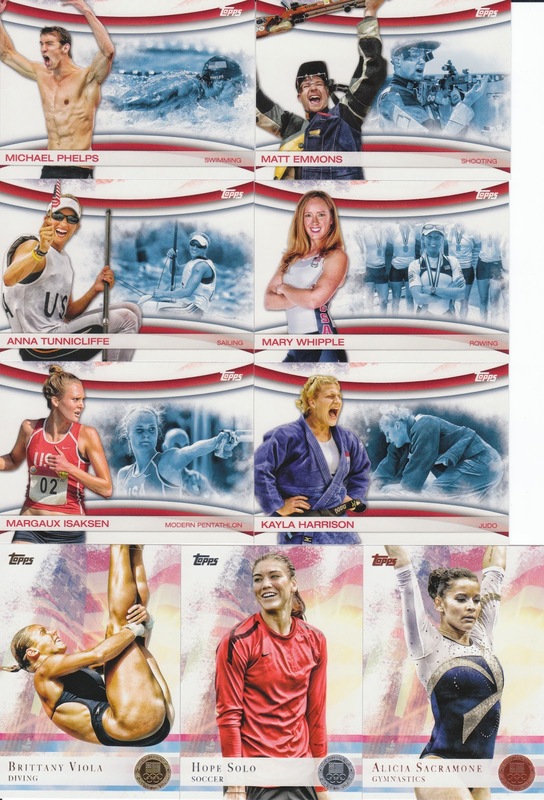 Topps Team USA Contest Randomization! Trade Report - Dennis and Marcus!! !